Walking into your local gym or fitness studio can be intimidating. Most personal trainers look like they could crush you with their pinky toes, and the torture devices -- or as some people call them, exercise machines -- cast ominous shadows that make you second guess going near them, much less using them. To help you navigate this confusing world, here are the only contraptions worth your time during your next gym sesh. Many people avoid the rowing machine because it's unfamiliar. 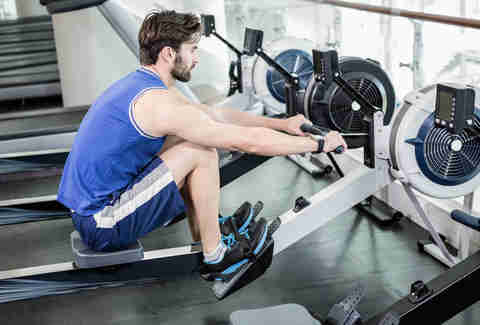 But with proper form and a learned, powerful leg drive, rowing is an amazing exercise for whole-body strength and power, says Garner Pilat, fitness manager at Orangetheory Fitness in Brooklyn Heights. "While rowing is a low impact exercise, it’s also a full-body movement utilizing an estimated 80% of your muscular system. And it burns lots of calories!" Want to pull off a pull-up, but finding it kind of… impossible? Don’t just dangle there. An assisted pull-up machine can help accomplish your goal, says Mindy Kim, yoga instructor at TruFusion. The machine uses counterbalance weights to make the exercise easier, yet effective. Pull-ups involve just about every upper-body muscle between your waist and neck, meaning you’ll get the same benefits of bicep curls, tricep dips, and side bends in one movement -- while building enough strength to eventually do the exercise on your own. For a quick, 30-minute full body strength workout, Ellen Thompson, a personal trainer at Blink Fitness’ Penn Plaza location, recommends your gym’s cable station for its incredibly versatile offerings. "You can isolate certain muscles by performing single arm lat rows or pulldowns [with cables]," Thompson says. "Or, you can increase your calorie burn by performing combination movements such as a squat with a lat row." Yusuf Jeffers, coach at New York City’s training center Tone House, seconds Thompson’s endorsement. "Because the resistance is attached to a cable, any movement happens freely in three-dimensional space and is not fixed to a specific axis," Jeffers explains. "This demands increased stabilization, allowing individuals to address any deficits in strength on a particular side of the body." This machine -- the one your parent’s probably put in the "home gym" they made out of your room when you moved out (if you haven't left, they have big plans for your room) -- is essential for those biceps you can expect to see bulging out of a tank top at the Jersey Shore. "The preacher curl machine allows one to get full extension of the bicep due to the incline slope, putting more stress and impact on the muscle than an average bicep curl, which will increase its size and strength [over time]," Paul says. Erin Kelly is a writer, runner and triathlete living in New York City. Her favorite gym machine is the water fountain. Follow her at @erinkellysays.